Temples of India signify the very root of Hinduism and its culture. To be worth of the trust reposed by our ancestors, it becomes our primary responsibility to sustain our heritage for generations to come. Those who have visited the rural areas of Tamilnadu will agree how badly the very breadth of Indian Heritage and culture has been eroded. This kind of erosion continues even now because of the negligence of the people towards the preservation of the tradition and culture . Rural life , bound by agriculture does not attract the new generations any more. With the advent of Science and Technology people leave their home towns and villages and migrate to Urban areas. However the elders remain in their ancestral villages as it is too difficult to pull on if they want to follow the youngsters and migrate to green pastures. Retaining the poor in their respective places is going to be a real challenge for the Government as well. The result of the migration is an open book for anybody. The reasons cited are many. The fact remains that every one wants to become rich overnight and ready to do anything to achieve this goal! When the neighbour takes modern education and earn huge salary, it is quite natural for others to be attracted and switch to the new life . They are prepared to sell their lands and other properties to fetch a new beginning at any cost ! In this process, the epicentre of the villages i.e. the temples around which all activities were functioning is totally forgotten. The lands donated by philanthropists to the Temples not only met the expenses of the shrines round the year,but also served the locals both directly and indirectly. 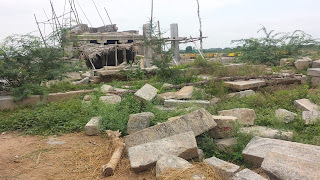 People have started noticing the failure of H.R & C.E department of the state Government in maintaining the Temples. 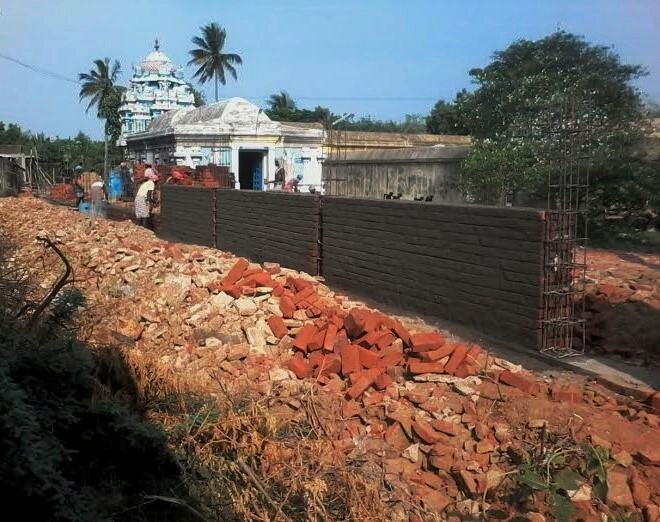 The renovation and maintenance of the Temples is left to the donors as most of the lands are grabbed illegally and the rituals are reduced from four times a day to just one time ! 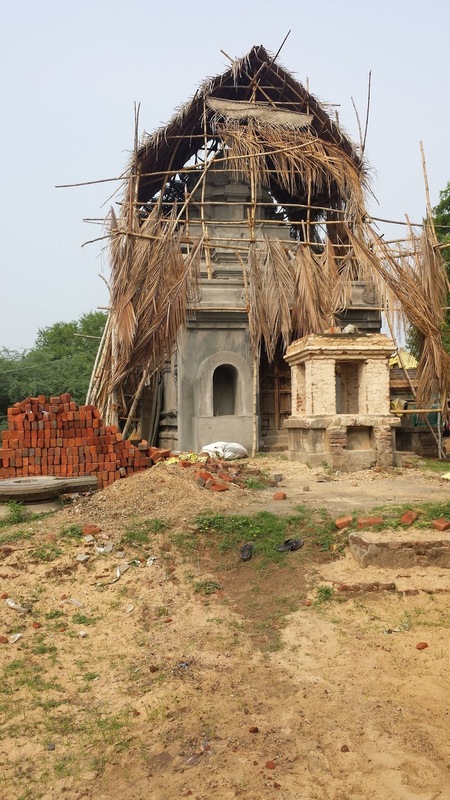 Although the HR & CE was not ready to share the major part of the budget estimated for renovating the temples , it was allowing donors to do the job if they came forward. They still hold the key of granting permission to do the consecration on a particular date only! Of late, it is heard that they delay the entire process by routing the request for renovation to other departments. Hence the start date is getting delayed and people have to wait until they get the orders. When we look at the other side of the renovation work, we should agree that there are some places where the original structure is altered and mindless painting is carried out on the inscriptions. But the executive officer can visit the site and insist the donors and others not to indulge in such alterations instead of making the process more complicated. There are scores of Temples where the respective executive officers seldom visit them. The unnecessary delay in granting permission to start the renovation work and consecration make everyone frustrated. If the Govt is not willing to do it on its own it should leave it to the donors with the supervision of the executive officers. More than thousand year old temples are left unattended due to sheer negligence. Only God knows why the people keep silence and allow the destruction to happen. If Democracy is by the people, many of us can question the Govt why it keeps a blind eye at the dilapidated temples. In this context, we wish to take our readers to a Shiva Temple at Uma Maheswarapuram near Tiruvarur. 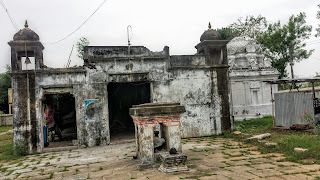 In fact there were two Shiva Temples in this village of which one was pulled down during British period while laying a railway line between Tiruvarur and Tiruthuraipoondi. At that time the villagers could not protest and stop the demolition. Hence they brought all the deities and housed them inside the other Temple located inside the village. They would not have dreamt that the second Temple would be neglected in due course. The second Temple which gave "asylum "to the first one lost its Ambal shrine fully in due course. As there was no compound wall, a road was created adjacent to the temple by encroaching the premises. Therefore a new shrine had to be built for the Goddess to the right of Shiva Sannadhi and the renovation work was started. It came to a standstill when it was realised that new shrines had to be built for the deities brought from the other temple. 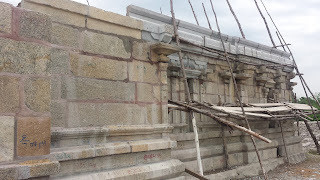 Initially the work on Ambal Sannadhi was started and it went upto lintel level. It could not be completed due to lack of funds. Shiva Sannadhi can be built once the vimanam of Ambal shrine is constructed. An approximate estimate shows that it requires nearly four lakh to get the work completed. The villagers seek the help of philanthropists for the early completion of the job before going ahead for the consecration ceremony. We appeal to all like minded friends/devotees to join the noble cause and restore the deities worshipped by our ancestors and start regular rituals. You are requested to visit the Temple and those who stay far away may contact 9787462681 or 9840744337 to get more details. Please note that we wish to receive only the construction material and not cash. The donors can directly order the seller of materials like cement, gravel, iron rod etc to despatch the same to the site. Your participation in the "Shiva Kaingaryam " is more important than how much you contribute. Inscriptions on the walls of temples speak volumes of the History of the land, temple arts and culture. The emperors thought that it was essential to document everything they wanted to convey to the generations that would follow. A Chola inscription describes the effort taken by the Queen Sembian Madevi in copying and re-inscribing the inscriptions of the former Chola Emperors on the granite walls of a newly renovated temple when she undertook the work by replacing the brick walls. It is painful to see that the present generation ignores the rich Heritage gifted by our ancestors and allows the temples that carry the inscriptions to ruin. The efforts taken by the Government fail to meet the urgent attention required by dilapidated temples at various places. 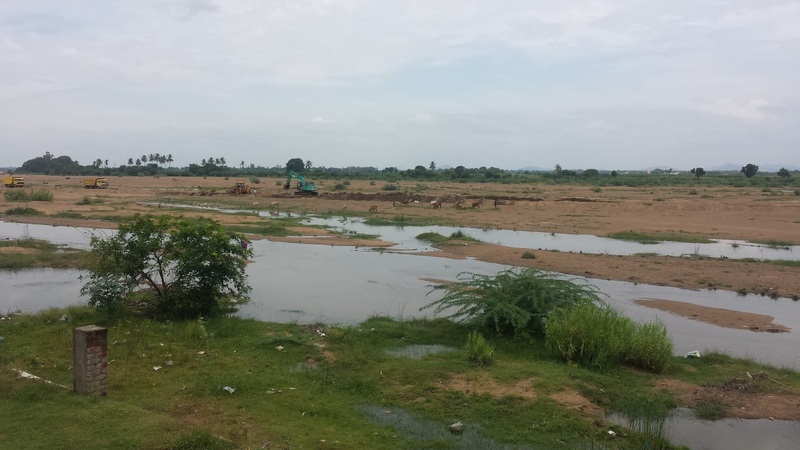 The land that lies between Thondai Nadu and Chola Nadu was called Nadunadu and the same is now known to contain districts of Villupuram and South Arcot. Villupuram district alone has over 1400 villages. Archaeological Survey of India has documented inscriptions of this region mostly during the British rule. The temples close to the river "Then Pennai" had to face the brunt from flood waters which was the primary cause of destruction. When we look at the three temples at Sitringoor, Peringur and Maringoor , the flood water has not spared the temple at Sitringoor in 1975, 1983 and 1993, although the river is 4 km away from the shrine. Perangoor was situated on the northern side of "Then Pennai " but the river had changed its course sometime after 1200 A.D. Now it is on the southern side of the river. Marangiyoor is located between the two rivers, Malattaaru and "Then Pennai" and one can easily imagine how the temple had suffered during floods. Sitringoor is now known as Siththalinga Madam . Thiruvennainalloor, where Sundarar sang his first Thevaram Hymn is on the east of Sitringoor. Inscriptions that belong to the period of Raja Magendran, Rajathi Rajan II, Kulothunga I, II and III, Paranthaga I , Rajaraja I , II and III, Vikrama Chola Sundarapandya, Veera Pandya and KrishnadevaRaya are found in this temple. Peringoor ( Now called as Perangiyoor) is on the southern banks of the river Pennai. It is located 10 km south of Villupuram. The inscription of Rajendra Chola I descibes the location as " Rajendra Chola Valanaattu Thirumunaippaadi naattu, Perangiyoor " . Thirumoolasthaaneswara temple at Peringoor under the care of many rulers of Chola Kingdom. Maringoor is badly affected by the repeated entry of flood waters as the temple is very close to the river bed. Marngiyoor,as it is called now,can be reached via Kalpattu. The Heritage of this places is said to belong to the Sangam age. The Pallava Temple is no longer there. But we still find sculptures of Pallava period. Special mention has to be made about the Jyeshta Devi image found here. Legend says that Rama who was on his way to Lanka came here and the Lord Shiva of this place was thus known as Rama Lingeswara. During Chola Dynasty, this area was known as Rajandra Singa Nallur. 27 inscriptions were recorded from this Temple in 1936. The inscriptions give details of the gifts made by emperors and individuals to this temple at different periods. We also come to know about Malayamans who ruled this area under Paranthaka Chola I and others. Vikrama Chola vana kularaya who ruled Marangiyoor had gifted lands for the maintenance of the temple. Pennai river was not flowing close to the temple at that time,as seen now. The river, which flowed close to Thiruvennainallur had changed its course after few centuries and destroyed Marangiyoor temple. 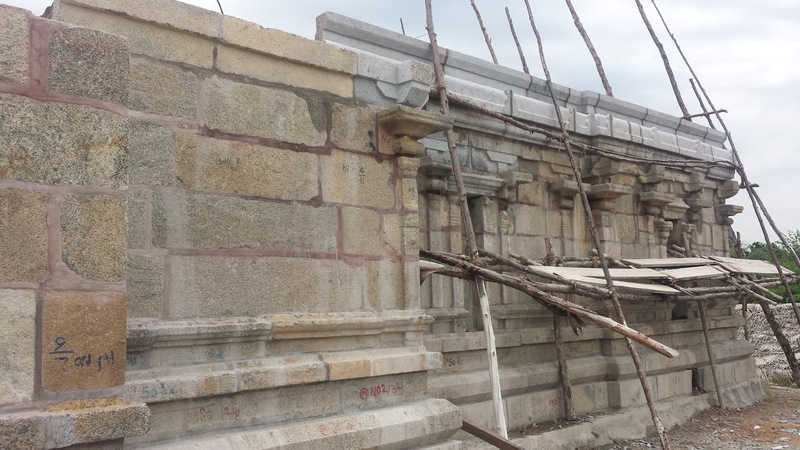 Efforts are being made to restore the Temple at its original place. The villagers are very much interested to make this happen at the earliest. However, this project seems to be beyond their reach as it involves realigning the original stones at the respective places without causing damage to inscriptions. A protective wall has to be built around the shrine to prevent damage from floods. As the work is on, Murthis are worshipped inside the balalayam. Further details can be had from Mr K. Sankaranarayanan ,Mobile: 9159428289 & 9840425253. Burning the lamps with Water !! Thiruvarur is one of the oldest and Holiest shrines of Tamilnadu. Appar's Thevaram supports this view. Vanmeeka natha of Thiruvarur Temple is praised in all the Saivaite Thirumurais. It has been the abode of some Nayanmars like Sundarar, Viranmindar,Naminandi and Dhadiyadigal. According to Appar's Thiruvadhirai Padhigam, devotees from different parts of the land used to assemble for the festival. The Chariot, usually called as "Aazhi Ther " is mentioned in ancient literature. It was Naminandhi Adigal, a brahmin devotee hailed from Thiruneiper , some 10 KM from Thiruvarur ( on the way to Thiruthuraipoondi) performed a miracle with the Divine Grace of Lord Shiva. He used to walk all the way from his place everyday to reach Thiruvarur temple for serving The Almighty. He wanted to light ghee lamps at Achaleswara Shrine , located inside the Temple. As he required more ghee for the purpose, he went outside and approached some houses which were close to the Temple. Without knowing that those houses belonged to Jains, he made the request to them. They laughed at him and refused to give ghee to light the lamps. They even insulted him to go back and light the lamps by using water drawn from the Temple Tank. Highly wounded by their words, Naminandhi Adigal went back to the Temple and prayed at the feet of The Lord. At that time he heard The Divine Voice asking him to bring water from the tank and light the lamps. He obeyed the Lord's advice and brought water from the tank and lighted numerous lamps. It was indeed a miracle that all lamps burned throughout the night to the surprise of everybody. He continued to serve The Lord by shifting his residence from Thiruneiper to Thiruvarur. The Lord even made him realise all people of Thiruvarur are Shiva ganas. The Nayanar's remarkable service is praised by Appar in his Thevaram Hymns. The birthplace of such a great Nayanar at Thiruneiper has an old Shiva Temple. Left uncared for several decades, devotees from outside have built a small shrine close to the road by facing the main Temple. It was consecrated recently. Efforts are being made to renovate the main Temple The front mandapam is in a bad shape . It carries some paintings pertaining to the life of Naminandhi Adigal Nayanar. 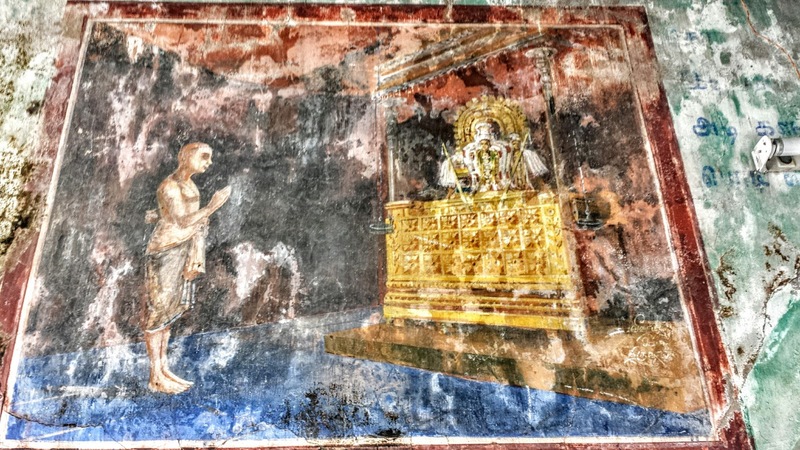 We may lose these paintings if the mandapam is allowed to collapse. It will be a great service if such dilapidated temples are brought back to their original glory. It will also help the archakas of rural temples who struggle to meet their basic needs. The state Governments do have a ministry to look after the affairs of the Temples. Of late,it is fired by enthusiasts for neglecting ancient Temples which do not have income. The officers appointed for the administration of the temples seldom visit the places of poor income. It is therefore left to the locals and outsiders to rebuild the dilapidated temples. As the cost of restoration has gone up, the work gets postponed only to weaken the structure further. With limitations soaring high, philanthropists need to face the challenges to restore the old glory. We have been repeating the need to act instead of just visiting and publishing the pictures dilapidated structures. We need to mobilise support to act as fast as we can. It is our experience that joint action of philanthropists and individuals have saved many Temples from ruin. We had been fortunate to participate in the reconstruction and renovation of ancient Temples without altering the originality. 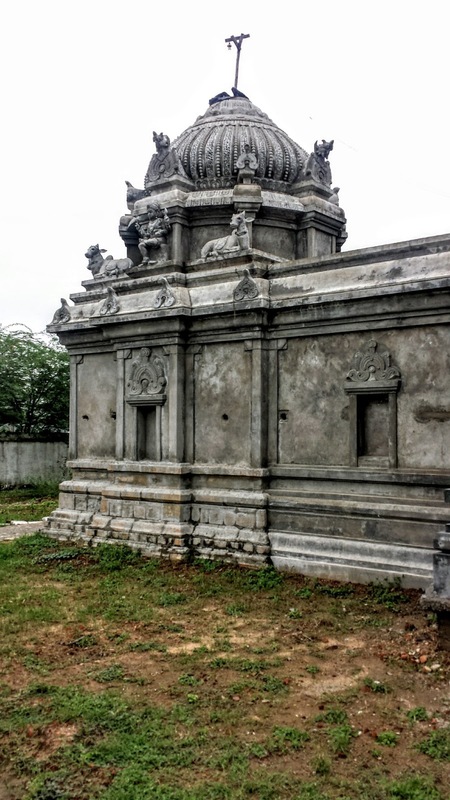 When we came across a Temple at Pakkam Kottur , a very small village some 20 km from Thiruvarur,we were shocked to find that the locals have practically given up the shine for several decades resulting into the collapse of granite structures in the front. As there was no compound wall, the vandals had freely entered and caused extensive damage to the sculptures that belong to Chola period. Chola inscriptions are still there on the walls. It was a heart breaking scene to see the idol of the Goddess inside the sanctum in broken condition. The HR &CE department of the Govt of Tamilnadu should be held responsible for the neglect. If someone comes across to take up the renovation work the dept wants them to get permission. When the work is on progress no officer of the department cares to see what is happening. But they are ready to dictate the date on which the Kumbabishekam can be performed. The donors had to carry out the entire work on their shoulders without getting any support from the department which "runs" the Temple. The granite stones of the front mandapam were numbered and dismantled to remove deep rooted trees and aligned exactly as before based on the numbering done. Nataraja Sabha was also renovated on the same lines. The locals had arranged to get the new idols made through donors. Gates were provided for all Sannadhis to ensure security. The consecration was held on 8th November 2015 with the help of Philanthropists. But the Temple still lacks a compound wall around it and the locals are on the look out for a donor who can complete the unfinished job. Panangattur is another tiny village on the border of Tamilnadu with Karaikal. The Shiva Temple at this place was badly in need of donors who could renovate the ancient Temple. We joined the Holy cause by renovating the shrines of Swami, Ambal and building the compound wall with the support of the locals. The consecration was held recently and the Temple is under daily pujas. 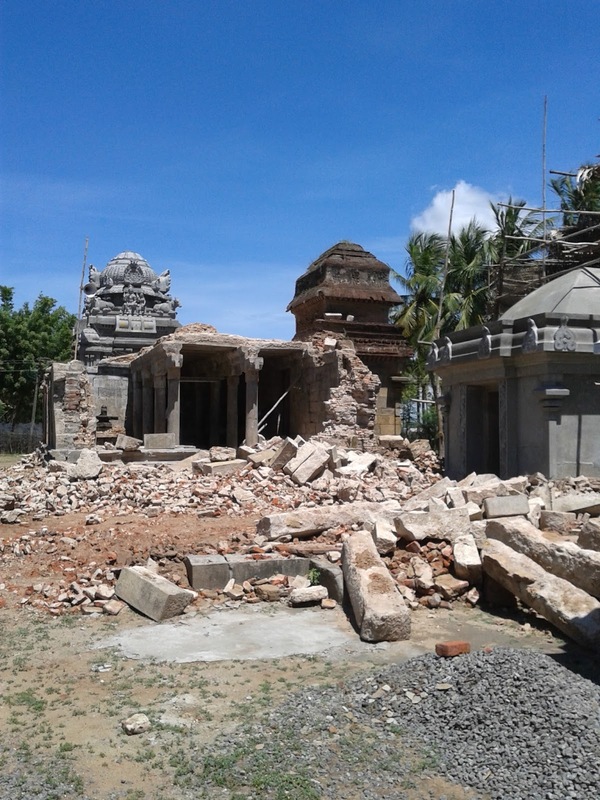 Sri Soundhareswarar Temple at Thurayur near Thirumarugal was one more Temple facing extinction. We were blessed to join the locals in rebuilding the shrine which needed urgent attention. The consecration of the Temple was held on 25.10.2015 to the delight of the villagers. We earnestly appeal to all like minded people to contribute their might to the Temples which are in negleted state. In the absence of regular income the Temples are in need of external support. We should not remain calm when the Heritage structures are lost one by one. It is high time to act fast and share the message among the like minded generous persons. Documentation as tool of Post-Mortem Process? What looked good in yesteryears may not necessarily hold good today. Even some time tested theories are undergoing revisions. There are occasions where we are driven to change our views. The concept, ' I am O.K. You are O.K' may be rewritten as ' I was O.K. Today I am not' It simply means that we need to reshape the past ideologies to suit today's needs. It does not mean anything that results into the loss of ego. On the other hand the revised concept may be more beneficial not only to self but also to others. When we talk about Heritage and Culture, the need for documentation became necessary to create awareness about our cultural values. We have read about Chola emperors who renovated the Temples built by their ancestors, used to restore the inscriptions . It showed the interest and care taken by them which is instrumental in knowing more about the past. Many inscriptions were documented during British rule and published. Similarly the masterly work of scholars like Neelakanda Sastri , Sadasiva Pandarathar and others help students of History even today. With the advent of Technology, people started sharing pictures and other details of historical sites by publishing more books. The last decade witnessed the entry of information through various social media. It can not be denied that it did help people to educate themselves by sitting at Home. At the same time we must admit that the information shared can also go to wrong hands. There were times when people were prohibited from taking Photographs inside the Temples. It is still in practice at some places like Guruvayur. Let us not debate on how it can affect the sanctity. The more important issue is that Photography helps to speed up the screening process in which the anti socials are involved. I know pretty well that many people will disagree with the view, fearing that the prohibition can kill the interest of Art lovers. Temples are different from Museums. Let us remember that the very purpose of our entry into a Temple is to worship the deities there. There is no doubt that we can also admire the handwork of the artisans. But there should be a clear demarcation between admiration and devotion. We admire the sculptures of horses with warriors , music pillars etc but the very moment we see an idol ,our hands fold unknowingly forgetting that as a piece of Art. It is the very purpose and essence of Idol worship. Once we step into the act of taking Photos and videos of Main Deities for the purpose of sharing through social media , Devotion is lost instantly and we start describing the Murti as the unique piece of Art. Of late , some ' Art lovers' are found to post as many as 90 photos of the Temple they visited which includes the pictures of Main Deities. They publish it in social media to make others feel their presence. They bluntly react saying, ' You are telling me? Documentation is the only solution to solve the problem...' This is where I differ with them. We are not against documentation. But what is the fun in sharing with everybody in the world when your treasures are open to high risk? Art lovers may maintain albums which may be useful in tracing the lost ones and help to identify them as strong evidence in the courts abroad. There have been instances when the idols vanished soon after the pictures pertained to them were published in social media. If someone talk about the identity and security of antiques, let them answer why the well documented and much publicised Kohinoor Diamond and Tipu Sultan's sword are not returning to the Motherland. Yet we continue to loose our antiques miserably. When we cry foul, we expect people to re look into the present procedures and try to introduce preventive measures. Museums across the world are exhibiting Indian antiques as their prize possessions in the name of gifts from art lovers. Does it not encourage the smugglers to make money out of it? How can the Museums call it legitimate when it is known pretty well that these antiques are stolen. Why don't they exhibit exemplary stand by denying to accept the property of other countries? Don't they have the commitment to alert the Interpol and the concerned Governments about the thefts? Before concluding we wish to state that documentation can be used as a tool in the post mortem process. The question addressed to the Government is how is that these idols are allowed to get away through the customs? Are they not passing through the scanner when ordinary passengers are subjected to follow? It is a rude shock when we see historic pieces as high as six feet and more find place in the museums abroad. How can such a big one miss the attention of the customs authorities apart from skipping the eyes of check post personnel of the origin? Let the Government take the primary responsibility and answer to the parliament and commit a date before which the lost one can be brought back. What we believe most is the availability of a Preventive mechanism . Documentation can be a corrective action. Why at all we allow the theft to happen and do very little to counter the challenge before us . Let all art lovers,archaeologists and well wishers unite together under a common umbrella to sort out the problem. Let us not bother that our individuality is lost by doing so. It will help shedding our ego when we unite for a common cause. Ardhra Foundation always believes to practice before preaching something in the interest of the society. Building Compound walls , providing strong rooms to store idols in rural Temples are some of the initiatives of the foundation.For more details, one may visit our website, ardhra.org As no single organisation can take up such a huge work in all Temples, we try to inspire people through blogs and direct interactions. At this stage we still lack a comprehensive mechanism to preserve our Heritage sites, the implementation of which is the immediate need of the hour. It is unbelievable but true. The scene we saw at Karupur a year back has transformed completely. 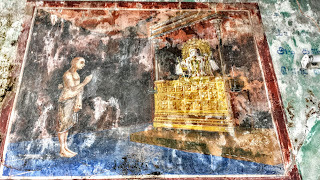 The Supreme Lord, Garbapureeswara whose sanctum was the only shrine left behind as the sub shrines of the age old Temple had completely dilapidated. Even the eldest of the village could not say when the ruin had started. They assumed that this was the status for many centuries and nobody came forward to rebuild it. But the place continued to carry the historic name as Karupur in official records. It was known as Garbapuri as it granted the prayer of couples who prayed for a child. The Lord and the Goddess,Garba Prathambikai grant the wish even today. It is amazing to see such a powerful place getting transformation during our lifetime. We saw the Temple for the first time when Ardhra Foundation involved itself in building a shrine for the Goddess at Peravur,located about 2 km from Karupur. The sorry state of the totally crumbled structure of the Sanctum at Karupur had a severe impact on us. We felt that the Temple had to be restored at the earliest . Sharing the news through social media had little impact and it was disappointing to note people failing to extend even a verbal support. But the Grace of God was the only source of strength to go ahead with the project with the liberal contribution from our Trust members. We knew the limitation of the villagers who relied only on agriculture . Since they could not take over a sizeable part of the renovation and consecration, AF took away the pressure from them and completed the project with the set target of conducting the consecration ceremony in the Tamil month of "Thai " which is the beginning of "Utharayanam " with the auspicious day in Suklapaksham. It was originally thought to remove the tall trees rooted deep into the Swami vimanam. Once the work started,it was realised that the whole structure right from the foundation was too weak as it was made of bricks. Reloading with fresh bricks was just impossible since the foundation could not withstand the load over it. Hence it was decided to take photographs of the old structure and rebuild on the same lines. Granite stones were used for laying the foundation. The entrance to both Swami and Devi Sannadhis were also provided with granite stones. After carefully studying the old structure, vimanam was raised over the Sanctum. The next big task was to go for new idols of Ganapathi,Subramanya,Gabaprathambika, Nandi, Chandikeswara as the same were not there. 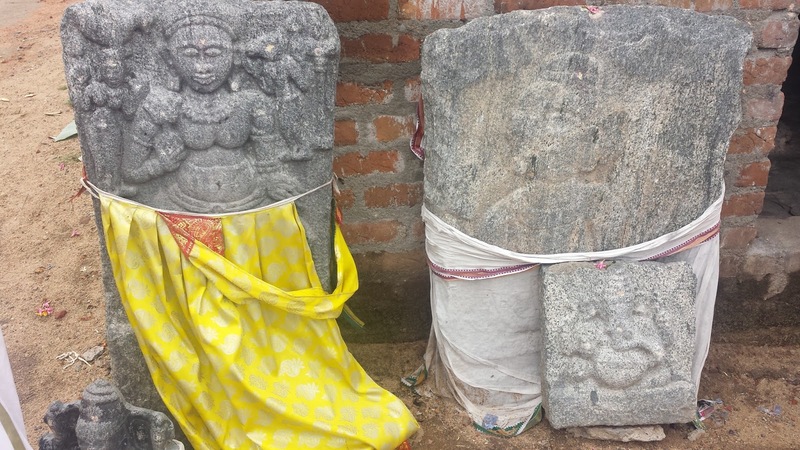 These idols were made after careful selection of suitable granite stones and sent to Karupur. They were placed under grains for about a fortnight and also under water for the same period. The Prakaram was cleaned well and the new Sannadhis for Ganapathi,Subramanya,Goddess, and Chandikeswara were built. But then the dire need of the hour was a compound wall. Since there were no donors for the ambitious work that could cost very high, we were content to build a fence around the Temple complex. Ardhra Foundation wishes to place on record the timely support extended by well wishers who arranged for Ashtabandhanam, flowers and Homam materials meant for Yagasalai.We sincerely thank them for the kind support rendered by them. The holy water was brought from River Veera Chozhan , a tributary of Cauvery that flows nearby. It was kept in front of Sri Athitheswara Swami at Peravur ,2km from Karupur. Then it was brought to Karupur Temple and the priliminary Pujas like Ganapathi Homam,Navagraha Homam,Mruthsangraharanam began simultaneously. Yagasala Pravesam was followed by Kala Pujas in the evening. Rituals as prescribed by Agamas were carried out for new idols ,by performing Pujas to the Holy Cow, Dhampathis, Veda Vith, Kanya,Brahmachari and Suvasini. The new idols were installed in the respective places and Ashtabandhanam was applied for all Murthis. People assembled to witness 4th Kala Puja and Poornahuthi on Sunday, 1st February in large numbers. Thiruvavaduthuai Mutt Thambiran Swamigal and Komal Sri Sekar graced the occasion. Gatams were taken in a procession and reached the top of the Vimanams. The crowd was thrilled to see Garuda making circles around the Temple at the Time of Consecration. The Holy water was poured over the Kalasams of all vimanams and sprinkled on the devotees. It was followed by Mahabhishekam at all Sannadhis. Good arrangements were made during the occasion and AF thanks all those who worked together to receive the blessings of Sri Garbapureeswara Swami and Sri Garbapradhambika Devi. May The Divine couple shower their blessings to all. It was indeed a great satisfaction not only to Ardhra Foundation but to the villagers of Karupur as well. The purpose of writing blogs on Dilapidated Temples is to inspire the people and focus their attention towards early rebuilding of the Heritage structures. Most of us know very well that these posts carry serious message of concern on the utter neglect shown and the failure to preserve the ancient structures. It is therefore sincerely hoped to find philanthropists who can help preserve the historic Temples. At the same time an equal amount of involvement is expected from the locals who can maintain the Temples after restoration. If we take a semicircular tour from Thiruvidaimarudur to Aduthurai, we come across many Temples which cry for immediate attention in small villages en route. To start the tour, a 3 km drive towards north of Thiruvidaimarudur takes us to a place called Thirukkudiththittai also known as Thirukuzhithattai where we find the Temple of Chola period. Sri Vedhanayaki Sametha Sri Vedhapureeswara swami Temple , not a very big Temple though, was in ruins sometime back. The villagers began the restoration work and removed the wild growth from all vimanams. During this process, they had to dismantle the structure and reassemble it stone by stone by carefully numbering them. 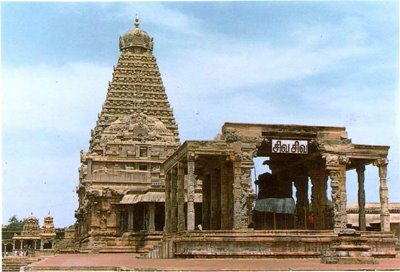 The Temple carries Chola inscriptions on the walls and it is believed to be of Raja Raja's period. On the outer walls we notice devakoshtams for Ganapathi, Dhakshinamurthi, Mahavishnu, Brahma and Durga. The Mahamandapam is common for both Swami and Ambal Sannadhis. A broken idol of Sage Agasthya is found in the Mahamandapam. Sun's rays fall on the Main Deity in the Tamil month of Chithirai ( from 3rd -13th) and again in the month of Avani (from 1st to 10th). at 6 o'clock in the morning. A sculpture showing Shiva Linga worship of a devotee (a King ?) with his family is seen on the outer wall. It is possible that he is closely associated with the Temple. It is pretty hard to find the Temple tank though it is right behind the sanctum. It is due to the presence of thick growth of plants surrounding the water body. The villagers are taking steps to remove the plants and make the area usable. Since the painting of the structure is the only major work pending as of now, one can expect that the Temple will be consecrated in the next couple of months.The villagers expect help from outside the village to meet the Kumbabhishekam expenses. We need to return to Thiruvidaimarudur to proceed towards South wherein we find row of Temples in seven places which were sponsored by Kings and Philanthropists . These endowments were called "Kattalais" and the places themselves were called as "Mudhal Kattalai, Irandaam Kattalai"and so on. They extend upto Eravancheri and Thiruveezhimizhalai. Of the seven places, only few are in good condition. Others are either dilapidated or partly renovated. The Temples of those places which are under the grip of other religions are worst affected as there are nobody to take care of them. A visit to "Mudhal Kattalai"makes us painful. As the Ambal Sannadhi is not there, it is being built . Foundation work is over and it has come upto the ground level. The compound wall is yet to be built. 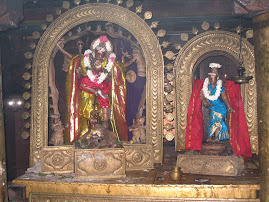 The idols are kept inside the thatched shed and the Puja is held there. The villagers pray for early completion of work and leave it to God Himself. "Irandaam Kattalai " must be hardly 2 km from Mudhal kattalai. Big cracks are found on the walls of the Temple here. The Temple Sri Kamakshi Sametha Sri Kailasa natha swami Temple of Irandaam Kattalai was under the maintainence of Agraharam which was located close to the shrine. As the migration of people from this village started, the downslide started for the Temple for want of caretakers. Had those migrated persons continue to contribute for the maintainance of the Temple, such damage might have been prevented. May good sense prevail atleast from now onwards, so that the natives of the place visit their ancestral village and take care of the Temple. Aaraam Kattalai is now known as Ammankudi, a famous shrine for Goddess Durga. Kailasanatha Swami Temple of Ammankudi is maintained well as people come here in good numbers. All these Temples have agricultural lands gifted by Emperors and well wishers. Though they come under HR&CE department of the Government no effort has been made to renovate them. Those who are still living in these villages are helpless and remain as mere witnesses. But they are ready to contribute whatever they can. Hence the arrival of Philanthropists to these Temples becomes the need of the hour. It becomes the way of the world to see that some Philanthropists are busy in building Temples abroad and being appreciated by one and all. 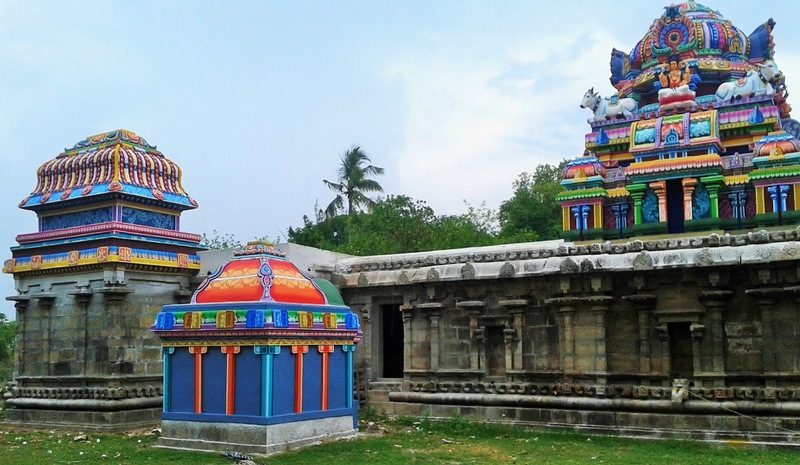 Gone are the days when special focus was given to rural Temples sung in Thevaram Hymns. It is not known why their successors fail to continue the great job done by their ancestors. We once again appeal to the natives of the respective villages to compensate the loss caused due to their migration. It is meaningless to build a new Temple in the colonies where they reside in urban areas and ignore the place where they were brought up. Let them remember that these old Temples carry forward the power generated due to worship made in many centuries. Let them also remember that many of these shrines were built by great souls who never expected anything in return. 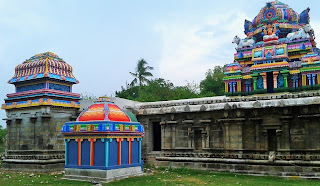 The Temples do carry forward their glory through Sthala Puranams, the age old Sthala Vrikshams and the Holy Tanks apart from the deities which are housed. This aspect is totally absent in Modern Temples. Despite these missing factors, people stand in long queues , buy special dharshan tickets ,purchase "Prasadams "from stalls and offer generously in the Hundis. It becomes our moral responsibility to appeal to the Philanthropists to come forward in rebuilding the old Temples of the land. We as ordinary citizens can also contribute to the Holy cause by offering atleast 2% of our income and support the affordable persons who may contribute liberally. The blog aims to create an awareness on the need to serve for the holy cause.